Two thousand miles from anywhere is an island in the Pacific–a place of great magic and mystery. Easter Island’s mammoth sculptured heads line the shoreline and the entire island, along with approximately five thousand human inhabitants. Sixty four square miles of land, alone in the Pacific. It is finally known that the heads are only part of the statues–the rest of the bodies lie beneath the earth’s surface. Archaeologist are digging down to reveal everything. What will our intuition as Spiritual Archaeologists reveal to us. Notebooks – Cameras – Recording Divices are encouraged. I believe we will make some exciting and revelatory discoveries of our own. Day 1 – Arrive from home at the airport in Rapa Nui (Easter Island) with time to rest and relax–breath in the pristine air. We ease into this amazing place and enjoy the day. This afternoon we venture out to Rano Kau Caldera and Orongo Village to see low-lying ancient stone houses. There are well-preserved petroglyphs to examine. Day 2 – Tour the Rano Raraku Quarry up close, where the moai (large stone heads and torsos) made from volcanic tufts were carved. Looking at the place where these were made may be a source of information for us. More than 200 moai are still here in various states of completion, including one estimated to weigh approximately 250 tons. Lunch. Visit the Ahu Tongariki complex. Dinner and evening. Gather to share our finds and stories. Day 3 – Ready for a swim? Our visit to Anakena Beach where the unusual Ahu Nau Nau is located presents us with a great opportunity to utilize the magic of water in our explorations. The Spiritual Archaeologist is ever resourceful and intuitive! What will be learn about the moai with the red headpieces balanced on top. According to some researchers, these headpieces are identical to statues found at Tiahuanaco in Bolivia. Te Pito Te Henua, “the navel of the world” which we will visit–is nearby. What a wonderful day – and all the beauty to behold! Day 4– Off to the North Coast today. Ahu Maitake Te Moai can be found here–older. We visit the area of Vinapu, unique as it may be the oldest stonework on the island. The relationship of these mammoth carvings can be compared to works found in South America. Day 5 –A visit to the island’s museum, Museo Antropológico Padre Sebastián Englert, reveals mysterious artifacts for our examination. An opportunity to use our Spiritual Archaeology skills to the fullest. A “female” moai is located here that gives rise to thoughts of alien civilizations. that some people feel looks alien. DaY 6– Free day to explore more, shop, and/or relax. We may want to visit additional sites today.Includes a farewell lunch. Fly to Lima 6.20pm flight- arrive Lima 11.10pm. Day 7-Fly to Cuzco early this morning. Take the day to relax and acclimate to the altitude. Peru journey begins tomorrow. The time to trust ourselves and the information we receive is Now. It may be a learning experience for some of us to look inward, explore on our own, and trust what we divine. Spiritual Archaeologists use highly tuned sensitivities and rely upon insight and intuition to look into hidden and invisible dimensions of sacred places. Information gathered can have personal, historical, spiritual or other significance. Traditional, cultural and logical explanations about our past are transcended when we take the time to explore invisible worlds, speak with our ancestors and trust, trust, trust what we receive. Mining the wealth of our hidden histories, sensing the intentions and uses of sacred places and finding our own unique pieces of a complex human puzzle restore us to multidimensional wholeness. Our traditional histories tell us we are 5,000 years old, yet evidence–geological, astronomical and archaeological–indicates a much earlier and highly advanced presence. What can we learn and reintegrate from our true history–our hidden history? Those of us who feel there may be great value in understanding our ancestry and lineage will have fun exploring and finding our unique answers. Ideas presented here are intended to trigger insight—have you delve into the possibilities—take a look at one site–Easter Island–and let the depth of your knowing come forward. Easter Island is a place of some 20,000 archaeological features, many caves, thousands of wild horses roaming at will, volcanic craters and about 5,000 inhabitants. This island in the Pacific is the most isolated human habitation in the world whose nearest neighbor, Pitcairn, is 1,300 miles away. Easter Island’s area of 64 square miles is the top of an ancient extinct volcano. In the eastern corner of the wedge-shaped island lies one of the extinct craters of the Easter Island volcano, and down in the crater lies the sculptor’s amazing quarry and workshop exactly as the old artists and architects left it. The largest of these figures from Easter Island was sixty-six feet long and almost completed before the sculptors fled. Finished and set up, the top of the statue would have been the size of an eight floor building. The areas of Ahu Vinapu, Uru Uranga, Akahanga on Easter Island have the remains of a style of precise stone fitting common among South American cultures like the Inca. 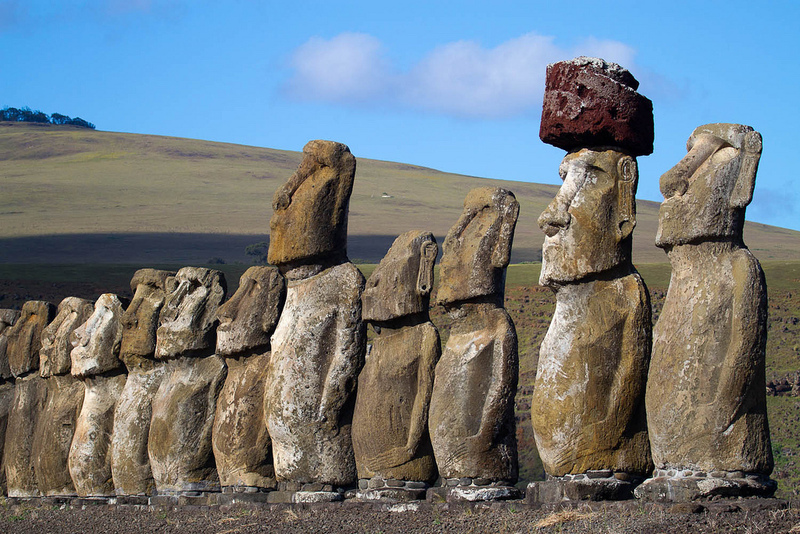 This undeniable similarity in stonework led explorer, Thor Heyerdahl, to suggest South Americans were present on Easter Island and influenced the culture. Legends of the Aymara people in Peru speak of Viracocha, the famous sun king, also known as Kon-Tiki–the creator of the Incas, Mother Earth, the Sun and all else. Viracocha emerged from Lake Titicaca in Peru as a light bringer—he is represented as wearing the sun as a crown with thunderbolts in his hands. Displeased by his first creation, he destroyed it with a flood and he shaped clay figures, breathing life into them and instructing them in language, customs, knowledge, arts, mathematics and civilized behavior. While dates of Viracocha’s existence vary, we know the flood was around 10,000 years ago, since it appears in many creation stories around the world. Viracocha can be followed in mythology and architecture from Mexico to Central America and into northwestern South America as far as Peru. Known a Kukulkan by the Maya, Quetzalcoatl to the Aztecs, Gucumate in Central America, Votan at Palenque in Mexico and Zamna in Izamal–Viracocha may have been from an early civilization from across the Atlantic (Atlantis?). Inca legends tell us that Viracocha and the “white bearded men with long ears” built the enormous ruins at Tiahuanaco in what is now Bolivia and erected the abandoned giant statues in the Andes Mountains. Tiahuanaco has been dated at 15,000 BCE based on geological evidence that the Altiplano on which it is built rose to its current height between 12,000 and 8,000 BCE and contained a seaport. The Kallasasaya, an extensive structure at Tiahuanaco is astronomically aligned to the heavens and is laid out as an observatory around 15,000 BCE. Viracocha left Peru, legends say, and travelled across the ocean to the west by walking on water—others say he left on a raft of writhing snakes—still others say he made his way on a fantastic ship that sinks in the water and travels under the waves (a submarine). Europeans first visiting Easter Island reported seeing mysterious “white men” with long flowing beards. They determined these people to be descendants of the first race on the island. They were told that the inhabitant’s ancestors came across the sea from the east in large vessels some fifty-seven generations (400-500AD) before. The race from the East were called “long ears” because they artificially lengthened their ears by hanging weights on the lobes so the ear hung down to the shoulder. Moai statues, 900 of them, 4-33 feet high, featuring coral eyes with obsidian pupils, some weighing more than 80 tons are ancient inhabitants of Easter Island—waiting to be heard, to have their stories told. The enormous statues found on Easter Island and in Peru all have long ears. In both places, gigantic blocks weighing many tons were transported long distances over rough ground before being set up on end as enormous human figures, or raised on top of one another to form mysterious terraces or walls. The statues at Easter Island are decorated with a belt which was always carved round the figure’s stomach. The legendary emblem of the sun-god Viracocha, the rainbow belt, is found on every statue in Peru and Easter Island. A myth tells us that the sun-god had taken off the rainbow (his magic belt) and used it to climb down from the sky to Mangareva. There, he peopled the island with his white skinned children. The sun was once regarded as the oldest original ancestor in all the islands as well as in Peru. Red headdresses for high ranking and important individuals were worn in both Polynesia and Peru. The colossal statues left in the Andes Mountain of Peru were decorated with red tufts of stone placed, or balanced, on the head of the figure. To acquire this red stone, it was necessary to travel long distances. The sculptors succeeded in balancing an extra giant block of red stone like a colossal wig on the top of several of the heads at Easter Island, some thirty-six feet above the ground. In 1947, Thor Heyerdahl, author of Kon-Tiki, adventurerand explorer, and a group of fellow explorers set out from Peru in a balsa wood raft, sailing westward into the setting sun toward Easter Island and other islands in the South Seas. Heyerdahl believed the islands were settled by the legendary being, Viracocha, also called Kon-Tiki. He named his raft Kon-Tiki and set out across the Pacific, just as he believed Kon-Tiki did in the distant past. Heyerdahl’s journey is a great story. Along the way, he reports meeting Tei Tetua, the sole survivor of all the extinct tribes on the east coast of Fatu Hiva. Tei Tetua remembered and believed in his father’s and grandfather’s legendary stories of the great Polynesian chief-god Tiki, son of the sun. Tei Tetua honored and worshiped his ancestors and their deeds. He could name them in an unbroken line back to the time of the gods and looked toward the day when he would be reunited with them. He believed it was Tiki who brought his ancestors to the islands where they live now. Heyerdahl states that on almost every island in the South Pacific, men of learning could enumerate the names of all the islands chiefs back to the time when it was first peopled. They often used a complicated system of knots on twisted strings as the Inca Indians did in Peru. Certainly not from the Melanesian or Malayan peoples to the westward. But the same old vanished civilized race, the “white and bearded men,” who taught the Aztecs, Mayas, and Incas their amazing culture in America, had evolved a curiously similar calendar and a similar astronomical knowledge which Europe in those times could not match. In Polynesia, as in Peru, the calendar year had been so arranged as to begin on the particular day of the year when the constellation of the Pleiades first appeared above the horizon, and in both areas this constellation was considered the patron of agriculture. Heyerdahl’s conclusion is that Kon-Tiki’s white bearded men with big ears did, indeed, sail across the Pacific Ocean and brought with them to Easter Island, their sculpting skills. They were the creators of the large statues we find there today. There is no trace of development on Easter Island that would have given the inhabitants the skill to erect these large masterpieces on the island, although they probably learned from and assisted the master sculptors. WHAT DO YOU KNOW ABOUT EASTER ISLAND? The foregoing information is part of the author’s research on Easter Island. As Spiritual Archaeologists we ask ourselves what might have happened that is not present in the material we are able to find. Traditional data on Easter Island suggests the inhabitants themselves were the sculptors some five hundred years ago and they moved these colossal statues into place by the use of ropes and rolling logs. There are many theories—what is yours? There are no “right” answers—so you cannot make a mistake. Your perspective has great value to everyone. What do you sense and feel about Easter Island? Is there a connection to Tiahaunaco in Bolivia? Was Viracocha a real person? What elements of this account ring true? Who carved these statues and what tools did they use? What else can you divine about the amazing figures on Easter Island? How were the colossal statues moved and placed around the island? For what purpose were they made? Did they have religious, spiritual or ceremonial significance? What stories do they have to tell? The task of gathering information about our hidden histories is one in which we can all participate. While there are many fine researchers in the public eye, the Spiritual Archaeology Society believes it will take the collective effort of all of us, as we trigger each other’s memory and knowing, to bring the full picture into focus. If you feel inspired, send your insights about Easter Island or any other sacred place to luminousedona@gmail.com for inclusion on the upcoming website: www.SpiritualArcheologySociety.org in the hidden histories section. She is a world-renowned researcher of sacred places and hidden histories. Luminous conducts Spiritual Archaeology Journeys and Trainings in Sedona and at other sacred places worldwide. NOTE: Hotels for Lima overnight and Cuzco overnight are not included in the pricing below. We can arrange these two nights for you, however. IMPORTANT: Easter Island is very small with few accommodations. We will need to book well in advance, since their booking policies are different than other destinations. Early reservations are encouraged.